The Ecore Tools Project (still in Incubation phase) provides a graphical editor for EMF Ecore models. 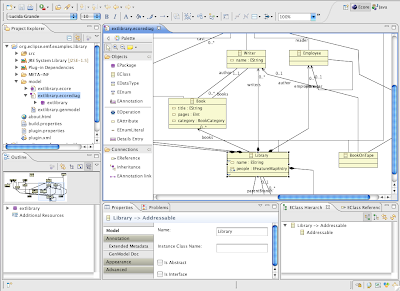 The Eclipse Ganymede package called Eclipse Modeling Tools contains the Ecore Tools. A notable feature is that you can create an Ecore diagram from an existing Ecore model. All model elements will be automatically added to the diagram and arranged. This makes it very easy to start using the diagram editor in projects that already have existing Ecore models. The following screenshot shows an Ecore diagram for the EMF Library Example created with a few mouse clicks .